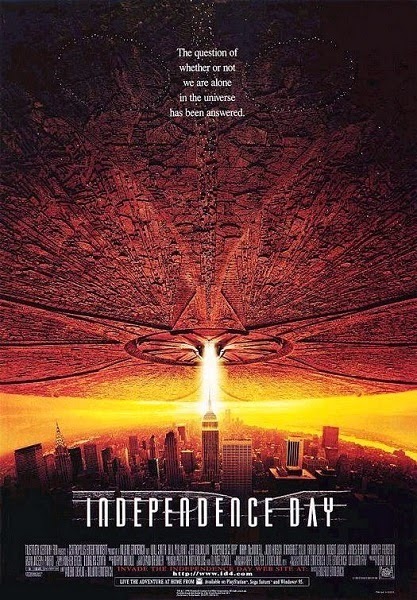 For this holiday, it seems appropriate to focus on a surprisingly literate gag layered into the background of Roland Emmerich's delightfully cheesy alien invasion epic Independence Day from 1996. The scene takes place as our heroes make their way to Area 51. As President Whitmore (Bill Pullman) enters the base's main situation room for a briefing on the status of the invasion, we see a display of the terrain with the standard numbers and incomprehensible text data flashing along the bottom. It reads "THE REASON FOR THESE GREEN(LINES?) IS TO LEAD YOU TO THINK THAT THESE WORDS MEAN SOMETHING" on one side, while the other reads "AND NOW I SEE WITH EYE SERENE, THE VERY PULSE OF THE MACHINE - WORDSWORTH." The first part seems pretty self-explanatory, while the second comes from the poem "She Was a Phantom of Delight" by William Wordsworth, a poem he had written about his wife. There doesn't seem to be any thematic significance to that reference beyond the graphic designers having a bit of fun, but when you consider the tremendous amount of random text that must be generated to decorate the background of scenes like this, often without much notice by audiences, it's admirable that they provide audiences with an extra dose of culture, if only subliminally. …a "fine detailing added to the surface of a larger object that makes it appear more complex, and therefore more visually interesting." I'm not sure why the plural has two Es here, but given the usage, it certainly sounds greebly. Ohh, I did not know that. Very good catch! !